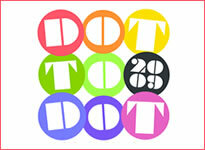 This year Nottingham and Bristol's Dot to Dot Festivals will take place on the weekend of 23rd/24th May. The festival showcases some of the best and most exciting up-and-coming artists and bands from around the world. Previous years have seen Dot to Dot play host to the likes of Klaxons, Laura Marling, Glasvegas and Alphabeat. Artists playing the events are due to be confirmed very soon. Bristol: The Thekla, The Louisiana, The Fleece, The Cooler, and Bristol Academy. Nottingham: Rock City, The Rescue Rooms, Stealth, The Bodega, and Nottingham Trent University. Early bird tickets will be available in January priced at £20. With hundreds of live acts and DJs and 16 hours of music each day Dot to Dot offers a unique experience for festival-goers and artists alike.